The number of registered motor vehicles (excl. 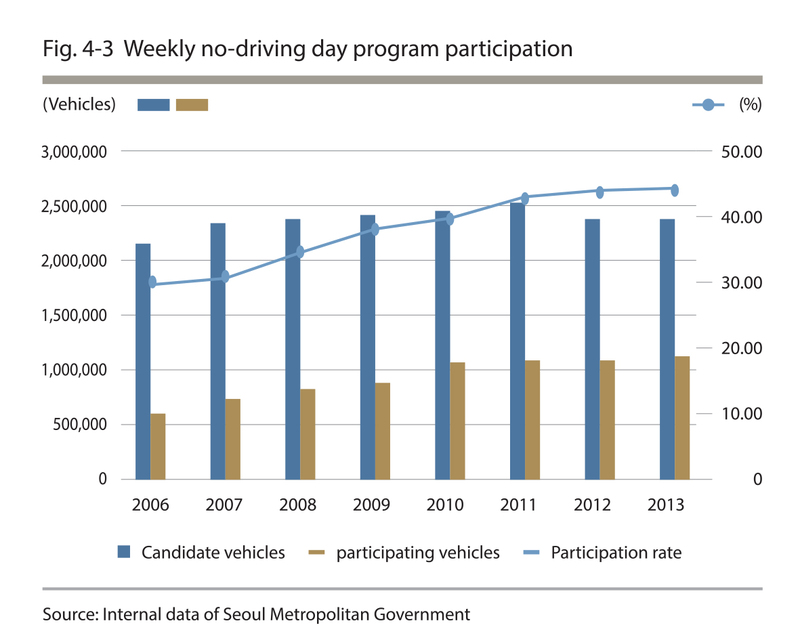 two-wheeled vehicles) in Seoul was 2,969,000 in 2012. It steadily increased between 2003 and 2010, but began to fail in 2011. While the number of registered passenger cars and two-wheeled vehicles has been increasing annually, the number of registered vans and trucks has been decreasing annually. 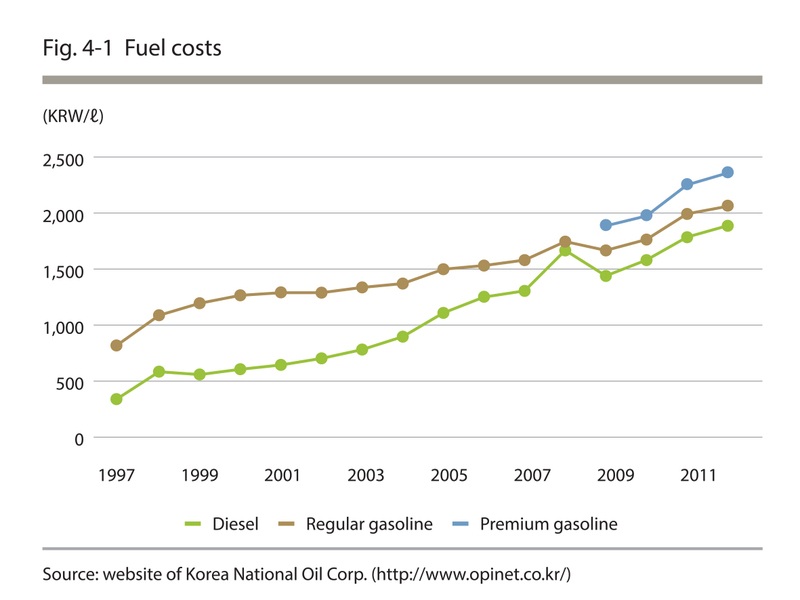 The average cost of regular gasoline (per liter) in Seoul in 2012 was 2,058.96 KRW, which was a 145% increase from 839.17 KRW in 1997. 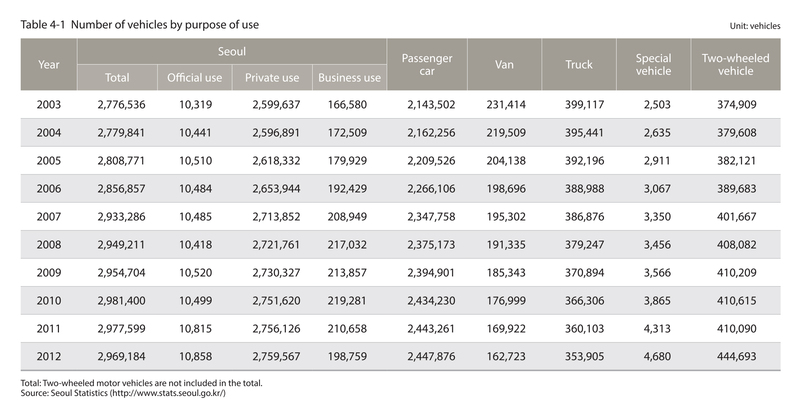 The number of passenger car trips based in Seoul was 7,502,000 in 2012, which was a 9.85% increase from 1996, but this figure has been declining since 2006. 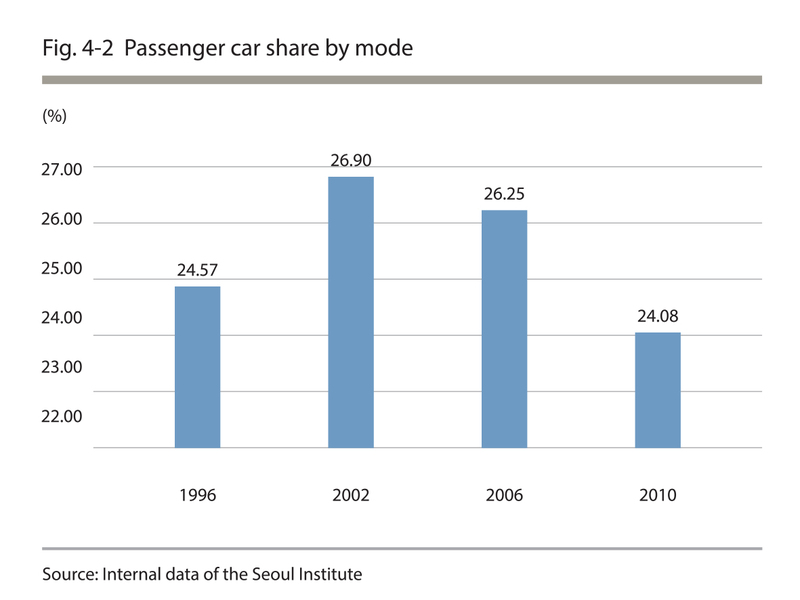 Furthermore, the passenger car share concerning Seoul has been steadily decreasing (24.08% in 2010). Under the weekly no-driving day program, the operators of ten-seaters and smaller cars used for non-business purposes must select a weekday on which they will voluntarily not use their vehicles. The number of passenger cars subject to the program including company cars has been increasing steadily since 2006 to 1,086. Participation rate has been recorded to be 44.4%. Corporate transportation demand management programs are implemented as a part of the traffic demand management(TDM) system with the aim to discourage any unnecessary use of passenger cars and to encourage the use of public transportation. Incentives are provided to companies taking part in TDM in the form of reduced charges imposed for inducing traffic. 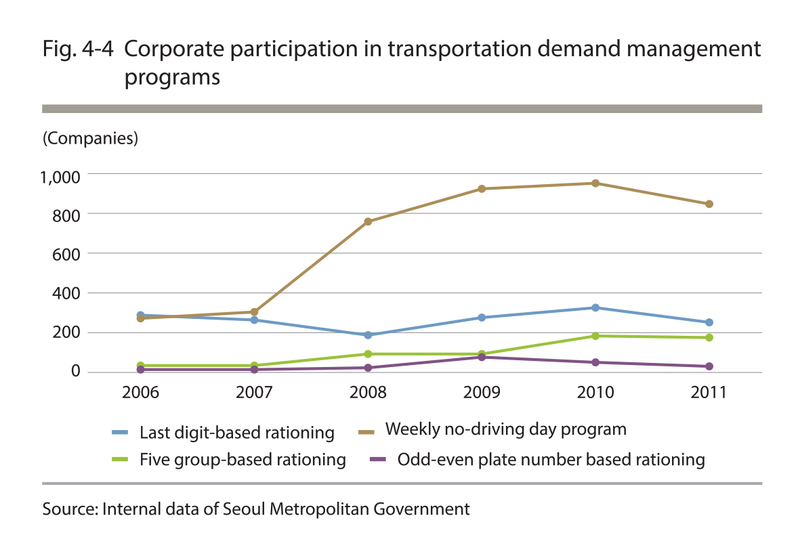 Of the corporation transportation demand management programs, the highest participation rate has been observed in the weekly no driving day program, with 847 participating enterprises as of 2011. 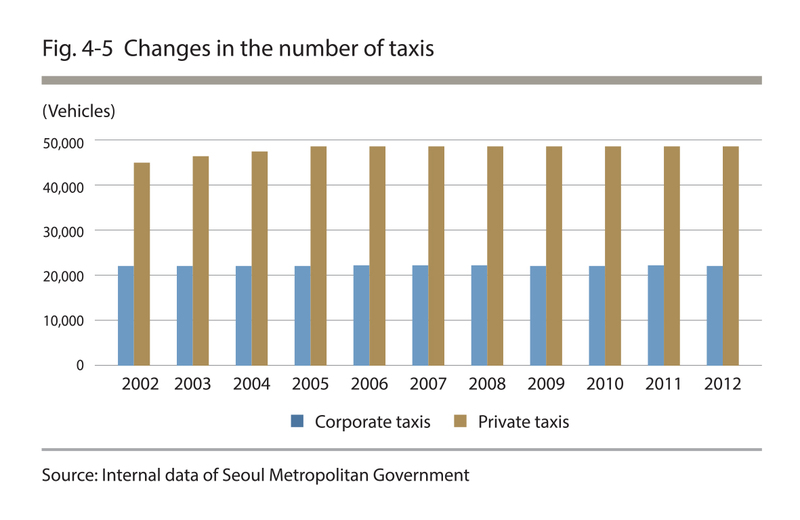 The number of taxis in Seoul has increased at an average annual rate of 0.32% (2,200 vehicles) from 70,002 in 2002 to 72,248 in 2012. 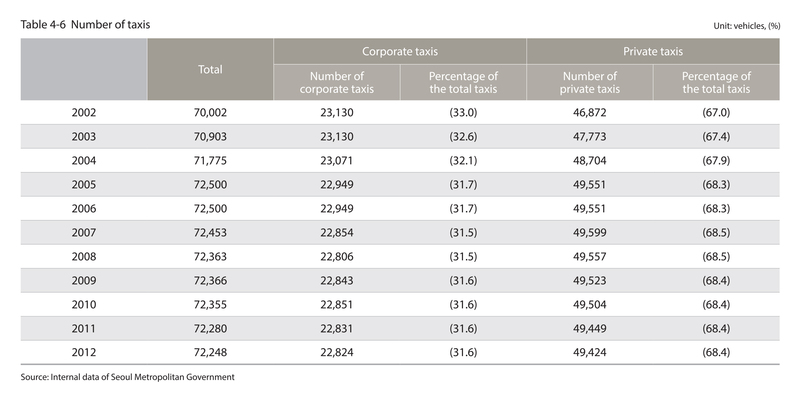 The ratio of corporate taxis to private taxis was 32:68. 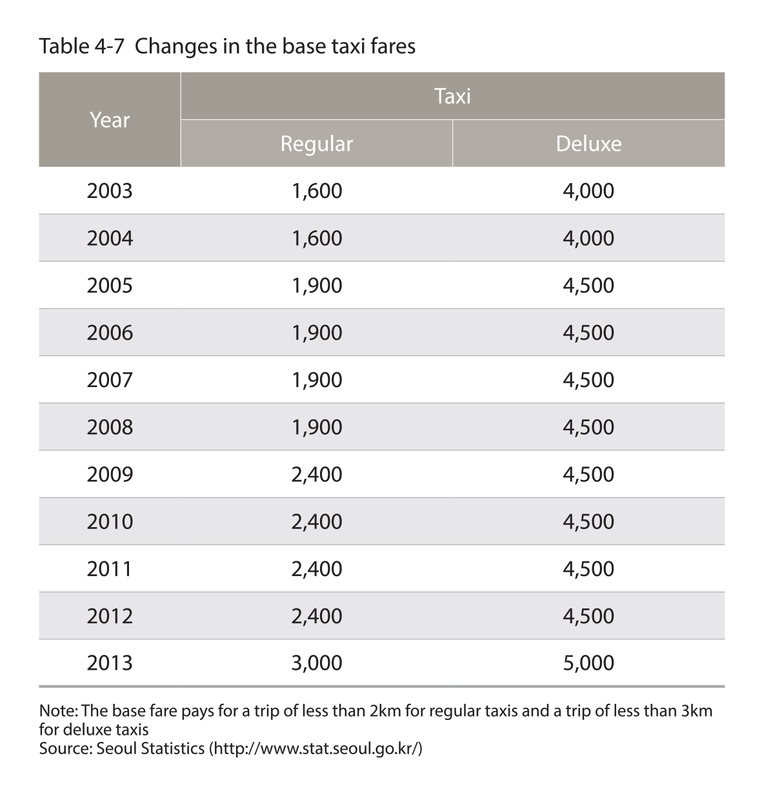 The base fare was 3.000 KRW for regular taxis and 5.000 KRW for deluxe taxis in Seoul in 2013. and this was an increase of 1,400 KRW and 1,000 KRW since 2003, respectively. 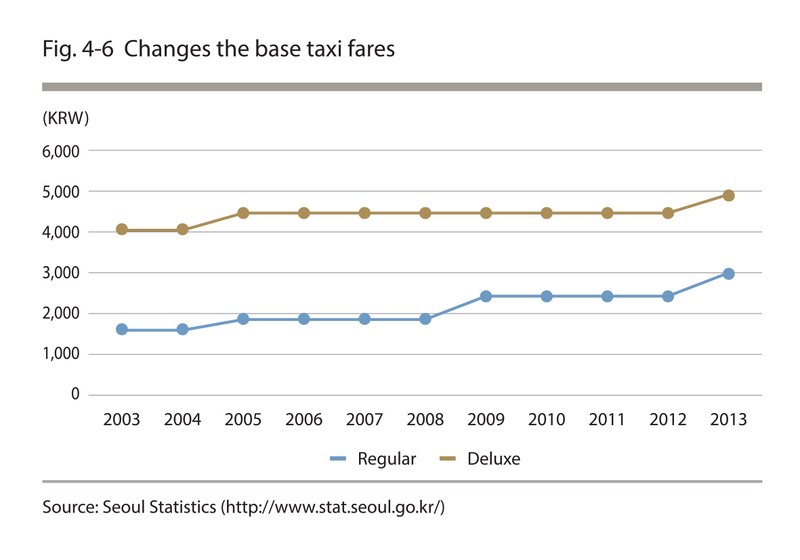 The base fare for taxis remained at 2,400 KRW for 4 years from 2009, but was increased to 3,000 KRW as of October 12, 2013. The additional charging rate was adjusted from 100KRW/144m to 100KRW /142m.